I recently watched 13th, a very well made and very depressing film about mass incarceration and racial injustice. I felt powerless to do anything. 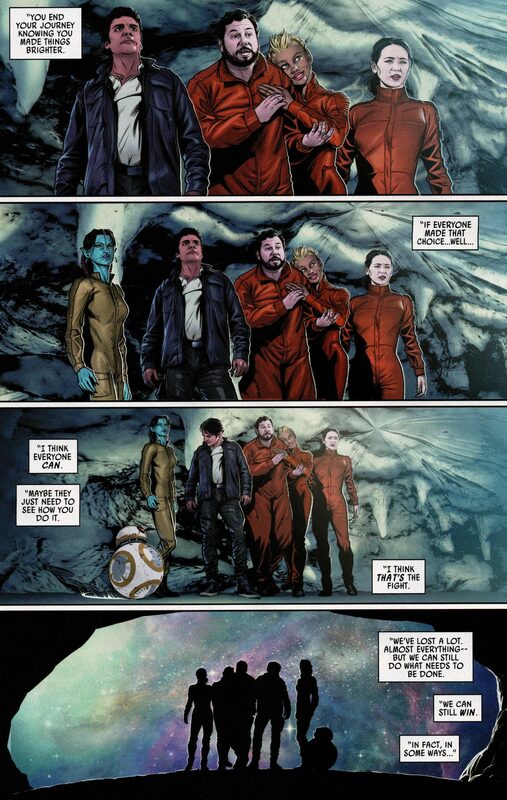 But believe or not, as I thought about The Last Jedi, the final Poe Dameron comic, and the ministry of Jesus, I found hope. While I don’t have all the answers, these examples provide a critical insight for individuals who desire to address societal and systemic problems. Our world contains countless problems outside the ability of any one person to solve. As a short list of examples, they include racial injustice, poverty, human trafficking, disease, famine, alcoholism and drug addiction, climate change, and violence permitted or perpetrated by governments. We find many of these and other problems in the galaxy far, far away as well. While the original trilogy of Star Wars shows a handful of people free the galaxy from tyranny, the additional movies, television, comics, and books present far more complex problems and solutions. Acknowledging this complexity, how does one person or a small group of people make lasting, positive change? Let’s examine 3 approaches. Having grown up hearing the stories of the Rebellion, Poe Dameron knew what a hero looks like. They accomplish great feats such as blowing up one or two Death Stars. In response, he becomes the best pilot in the galaxy and even destroys Starkiller Base, saving the Resistance. Heroes take crazy risks, not wanting to know the odds, and it works. Poe does the same, sending Rose and Finn to find the codebreaker in The Last Jedi. This time, however, their daring leads to the decimation of the Resistance. So many die that the entire army fits inside the Millenium Falcon. What went wrong? Star Wars became realistic. In real life, single individuals or small groups rarely make significant societal or systemic change, at least not positive change. There are few silver bullets (or silver proton torpedoes) to problems of this sort. The opposite of option one is to focus on helping one person at a time. The heroes of the Rebellion spend a significant portion of Return of the Jedi simply rescuing Han Solo from Jabba the Hutt. Finn risks everything to save Rey from Starkiller Base. Rose cares enough about one fathier (horse-like creature) to find joy in releasing it from captivity. This approach has two major problems. First, it leaves most starfish out to die. If we only help a few, most continue to suffer. Second, many who promote this solution fail to realize the systemic nature of problems. Focusing on helping individuals often addresses the symptoms but not the root issue. We are the spark that will light the fire that’ll burn the First Order down. 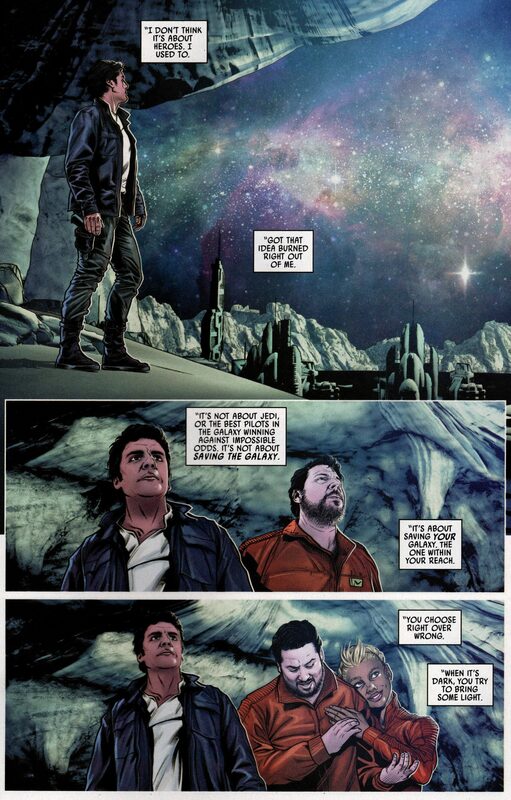 Poe Dameron Comic #31, contained in Charles Soule’s graphic novel entitled The Spark and the Fire, fleshes out his understanding even more. While it first appears that Poe argues for Option 2, there is a subtle difference. Did you notice the symbolism that each frame includes more people? The Resistance grows. The message becomes explicit when he says, “Maybe they just need to see how you do it.” By openly modeling how to “bring some light”, we exhort others to do the same and provide practical instruction. In other words, we help one individual at a time, but in a way that multiplies, in a way that reproduces. Poe’s monologue explains how a spark lights a fire. This incorporates the best aspects of the other approaches. Like option one, it focuses on the big picture, aiming to solve the whole problem. Like option two, it acknowledges our personal limitations and keeps us committed to people, not just principles or causes. We find the wisdom of Option 3 in Jesus’s approach to ministry. He proclaimed the arrival of the Kingdom of God, which he summarized as God’s “will be done on earth as it is in heaven” (Matthew 6:10). While this first involves spiritual transformation, restoring a loving relationship between God and people, it also involves societal transformation as people love one another in word and deed. Jesus made disciples and called them to make disciples who obey Him. Obeying includes loving God, loving others, and of course, making disciples. In other words, Jesus made disciples who made disciples. Living out Jesus’s teaching, this mass of people can now have a significant impact on the social problems listed earlier. Paul models the same ethic of multiplication when he says to Timothy, “The things you have heard me say in the presence of many witnesses entrust to reliable people who will also be qualified to teach others” (2 Tim 2:2). This reveals at least three “generations” of people impacted by Paul’s teaching: Timothy and “many witnesses”, “reliable people”, and “others”. Soon after Jesus’s ascension, only an approximate 120 followers gathered together. By following his command, scholars estimate they numbered 10% of the Roman Empire within 300 years, even amidst persecution. These disciples addressed systemic problems, elevating the status of women, rescuing children left to die, opposing state violence, and helping the unfortunate to the degree that Emperor Julian complained they “support not only their own poor, but ours as well.” While the impact of Christians has been mixed over the centuries, especially since then, they benefited society to the degree they obeyed Jesus’s teaching. When educating others about injustice, teachers can exhort people to share what they learn with others. Those struggling with addiction can help others by sharing from their experiences (which is the last step of 12 step programs like Alcoholic Anonymous). A volunteer at a soup kitchen can bring a friend to serve for the first time. Giving a microloan not only helps, but also empowers its recipient. What societal problems do you care about the most? What do you do to address them? How can you multiply your efforts? As I have encouraged you to act in reproducible ways, how will you encourage others to do so as well? A wonderfully insightful look at the problem and what our response should be. I had not seen that movie, 13th, but when I saw your post here I watched the trailer. Having ministered in jails in the past this post really touched me. The problem is systemic and entrenched yet every person filled with the love of God should yearn to make some difference. Your statement about how we should ‘bring some light’ was timely for me. Just a bit earlier this morning I was sharing with someone about the phrase that has become so common in the culture today, “throwing shade” meaning to disparage or insult someone. I said, I don’t throw shade, I bring light. Jesus said that we believers are the light of the world and that light must shine into the darkness around us! I’m glad you found the post beneficial and timely. Your example of choosing to “throw shade” or “bring light” reminds me that while changing the world involves proactive, intentional efforts, it also involves every little interaction. As far as multiplication is concerned, you are an inspiration in so many ways. I highly recommend watching 13th. Having done limited jail ministry, I found the documentary resonated with my experiences. (It even mentions the monopoly that charges exorbitant fees for phone calls, which was annoying to me, but completely unjust to the family and friends of people in prison.) At the same time, watching the film was eye-opening to see the vastness of the injustice, especially as it relates to race.